After going through a long list of rides by our La Fuga Strava Club members, we chose a select few epic rides and invited the riders to write us a short story about the experience. Now we’re bringing you their stories to read, review and decide which was THE most epic ride. The winner will receive a La Fuga casquette in recognition of their momentous effort as well as plenty of Strava ‘Kudos’. It was 4 degrees and I was standing at the bottom of Swains Lane in the middle of the April when I was offered the chance of a long weekend in the south of France. A quick calculation showed Mount Ventoux was only 27 times Swains in terms of elevation, so there was an huge economy of scale there. How hard could it be? A few weeks later I knew exactly how hard. We set off to Bedoin via the ‘scenic’ route which involved a completely unnecessary ‘lump’ that woke everyone up and raised the heart rate straight to ‘tempo’ within minutes. After a short stop in Bedoin to refuel and we were off, making the most of the gentle gradient and stunning vista from the base of the mountain. Ten minutes later the smile was wiped off my face when we turned left into the forest and began on the climb proper. Nine km of relentless slogging, on a road that seemed to go straight up. I put my head down and tried to keep my heart rate below my ‘are you kidding me?’ level. A local father photographing his son on a mountain bike from the side of the road expressed some concern when I approached him ‘ Pas si vite, pas si vite! !’ I will never be sure whether it was the dripping sweat, the laboured breathing, or the chewing of my handlebars which made him think I might not make it, but I politely thanked him for his concern and continued on my way. There was finally a break at Chalet Reynard, the relief of the wide sweeping corner tempered only by the fact that I was now out in a strong swirling head wind. Again, giving up all hope of style points I got down on my drops and continued to dig in, making the most of the alternating head/tail wind as I zigzagged to the summit. Passing the Tommy Simpson memorial was a brief distraction, although by this stage the roadside barriers were making so much of a creaking noise in the wind I was more worried they would be blown over. The sign for 1km to go was a huge relief to see, as was the random crowd cheering everyone as we rolled in. 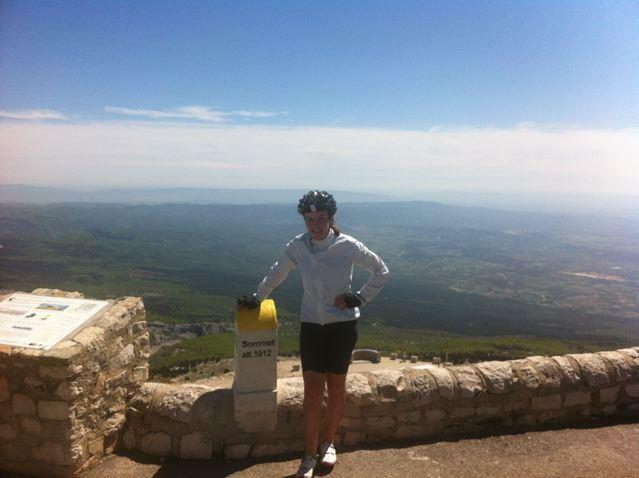 Nothing like standing on the rooftop of the world (or at least Provence) with just your bike. Only two of us set off down towards Malaucene while the rest of the group bizarrely chose the ‘lounge beside the hotel pool’ option. Its difficult to enjoy a 12% descent when you know an hour later you will be coming straight back up. A quick espresso at the bottom and we turned around, wind starting off at our backs, and enjoying the far more civilised 7-8% initial gradient. Obviously that wasn’t to last and the ‘12% next km’ sign coincided with a return of the headwind. Back down on my drops and all I could see was distance counter on my Garmin, as it ticked off every 100m. And at 8km/hr it doesn’t tick very often. My mate John was suffering as well and offering all sorts in exchange for my 28 ring on the back. Eventually with much relief we made it back to the top, at which point the hotel pool was calling. Needless to say the descent was relatively quick! I and 3 of my buddies in the Macadam Cycling Club (www.clubmacadam.com) on the South Shore of Montreal are signed up for the 2nd edition of GranFondo New York to be held on May 20th. While I had previously ridden a 160km and a 180km outing in the previous weeks to prepare for the event, none of my colleagues had. So 2 of them, plus 2 other clubmates, decided to tack on some extra miles to the club ride this past Saturday (May 12). 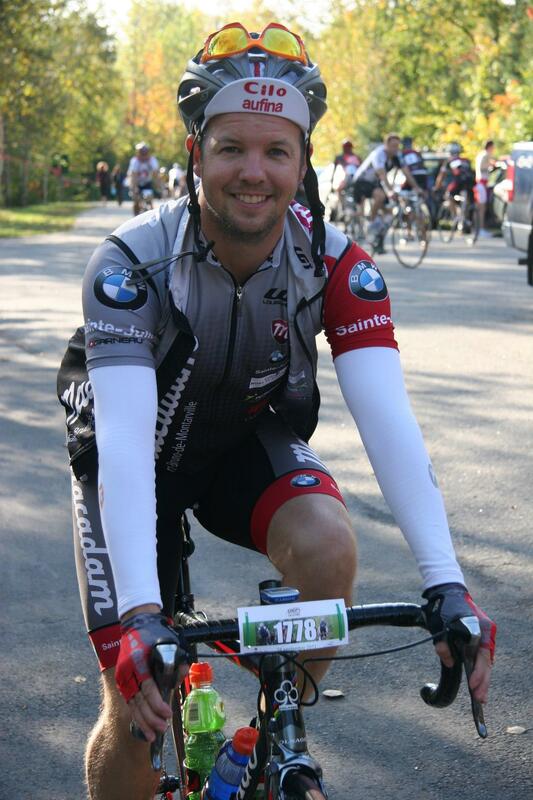 Instead of 110km, we would ride 170km, which we did all the way out to the St-Lawrence Seaway on a sunny day with little wind at all. With 30km remaining, I had pretty much worn through all of my chamois creme and was starting to get a seriously irritated backside. Nonetheless, I tacked on another 30km solo following the group ride in order to break through the 200km marker, ending at 208 and change. 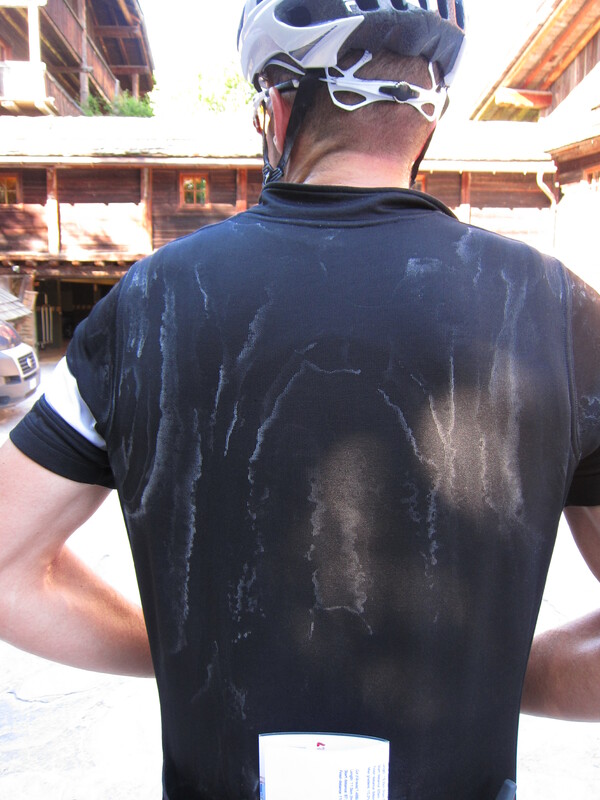 Upon removing my bibshorts, I saw a solid line of rash that followed the round back of my saddle. I swiftly and generously poured Johnson’s Baby Powder to take away the pain and dry it out. 48 hours and many applications of my wife’s hand creme later, there is still a very noticeable rash/tattoo/halo on my hind quarters. A novice rider training for the Etape du Tour under the expert guidance of La Fuga coach Huw Williams (‘I coach every ability – from you up to national champions’–which puts my ability in context – at the low end). Travelling to the Etape with La Fuga. One previous Century (with a shocking tale of bonking and near hypothermia) and one Etape du Tour (2011) just dodging the Broom wagon with a 1 hr 45 min slog up Alpe d’Huez in 37C heat. 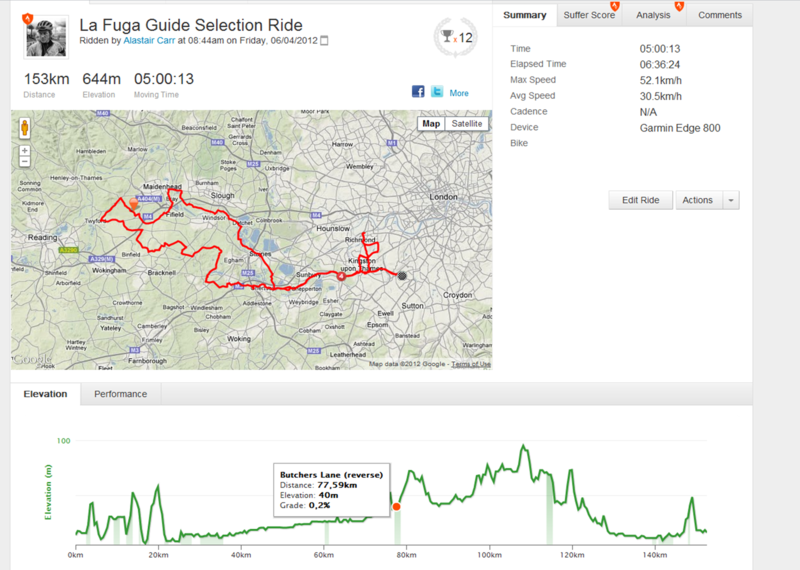 Surrey Audax route with ride to and from start. Combined approx. 175km and 2700m of climbing. Last attempted 12 months ago in pouring rain that resulted in one significant fall, 2 punctures, giving up and taking the train back from Dorking and having to peel bib shorts off from the congealed blood. Alex – The Super Novice. Started riding with Jitesh. The only difference – he is a good rider. The aim was to reach Shere at a very easy pace in 2 hrs and meet up with Super Novice Alex. I kept pulling the Veteran back as he tried to race ahead. The voice of my coach was shouting in my head ‘Pace yourself. Hold back. Hold back. Hold back. It will pay back later’. Other than a short controlled burst up Olympic Route climb Staple Lane, there was little drama in the first section. The Veteran threw up in the public toilets at Shere (he blames it on the chemo) where right on cue Super Novice Alex turned up with stories of wrong turnings and a monster climb just to get to the starting point. A short break to eat an energy bar and we headed off on the 32 km ‘Shere loop’. Every time there was a choice of two roads between a ‘Lane’ and a ‘Hill’ the GPS navigation pointed to the ‘Hill’. Minor drama after about 20km on a fast descent down a narrow single track lane as we turned a corner to see the typical pot holed tarmac surface replaced with gravel. Gingerly riding along this section we came across a couple of horse riders who had to dismount because their horses did not like the surface. A quick check of the tyres and we were off again. At this point The Veteran was gasping for a detour coffee break into Cranleigh. I dismissed the suggestion with complete disdain, offending The Veteran, then feeling guilty, promised him a sausage roll on the top of Box Hill. Best part of this section was as we approached ‘Winterfold’. The Veteran saw the 21% Gradient sign and nearly threw up again. Super Novice Alex saw the sign and the opportunity to notch another PB Strava segment and rode off into the distance. I played it safe and pushed through each false summit. Back through Shere and up Combe Bottom, if you pardon the phrase, and onto the ‘Dorking Loop’. A quick check for text messages to see if anyone was missing us (not), then another climb at Crocknorth, riding under the arched bridge onto Cycle Superhighway Ranmore Common. By this stage we had already climbed 1500m and the legs were starting to twinge and belly asking for lunch. Plan was to head down Ranmore Common Road and up Box Hill for a well earned break. However, Ranmore Common Road was closed due to a motorbike accident, so we headed straight down into Dorking. The Veteran nearly crashed at 50km/h into a line of cars queuing for the tip and had to break suddenly. At this point he decided to quit whilst he was ahead, still fed up at not having had his coffee break and now realising that I will not fulfil my promise of a sausage roll, whilst the two Novices soldiered on. Coldhabour Lane was a slog, then down and back up Leith Hill avoiding Tanhurst Lane, not because of the 14% gradient, but because of the debris, poor road condition and stream flowing down it. 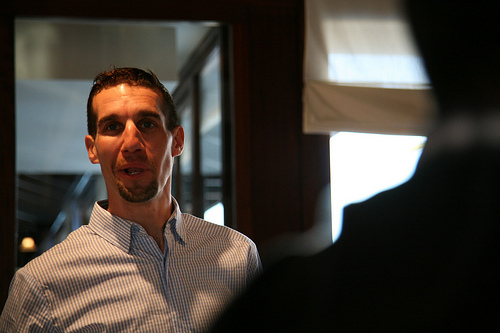 At this point I was starting to feel a little light headed and v. v. hungry. Was my fuelling strategy of one energy bar or gel an hour enough? I had already polished off two large bottles of electrolyte and still had at least 60km to go. The pain had begun. Leith Hill was a slow grind, and the additional climbing at Holmbury St Mary was taking its toll. I was no longer noticing the bluebells and scenery. The sun had disappeared, the wind had picked up and life was grey again. The descent on Radnor Road down into Peaslake was welcome relief. At Peaslake we parked our bikes at the bus shelter amongst the throng of mountainbikers. The coffee shop knew its market – I have never seen so many varieties of isotonic drinks in a general store. Lucozade and sausage roll replenished the parts energy bars cannot reach (ie. 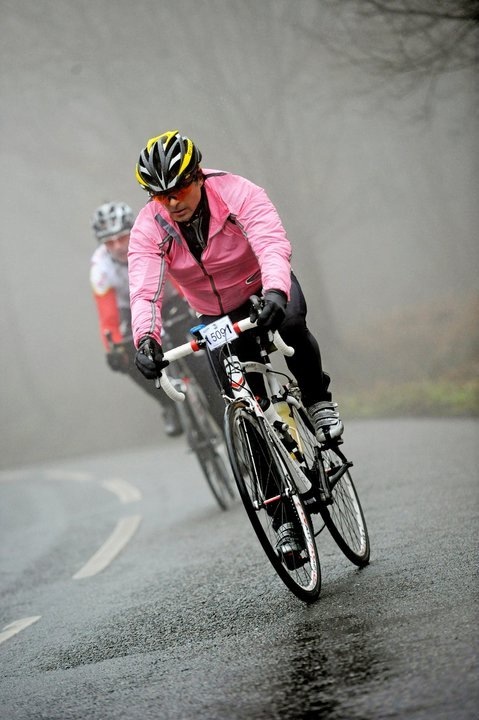 the taste buds) and we were ready to face Whitedown, 18% monster of Surrey and the Queen climb of many a sportive. Super Novice Alex saw the opportunity to hit another PB Strava segment, while I was in survival mode. After Whitedown, Alex headed back to Sussex while I still had another 2 hours riding to head home, alone. I was unsure whether it was mental tiredness or physical tiredness. Maybe it was both. My choice was either to take the easy route home, through Effingham Junction and back via Cobham, a downhill run which would improve my average speed, or check to see if Ranmore Common Road was open and one more climb up Box Hill. Would my legs take another climb? 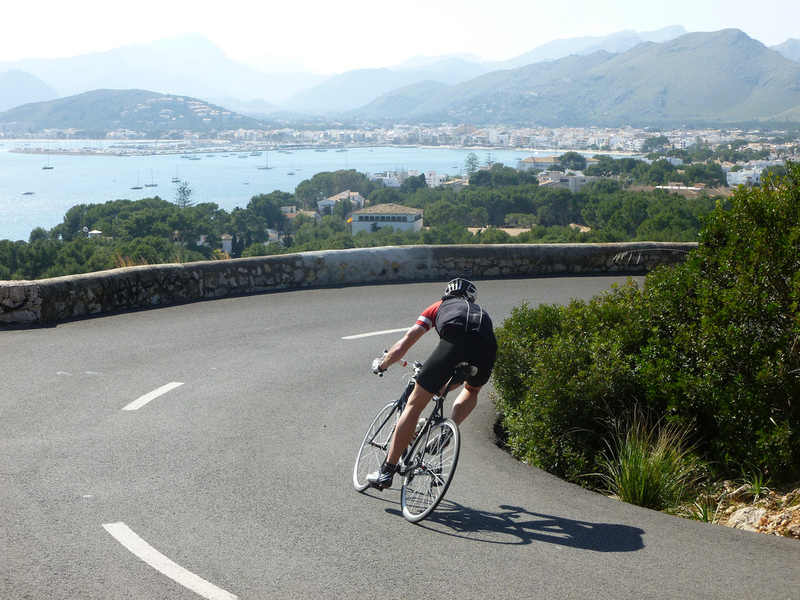 I understand that cycling is about suffering, so decided to go for the climb. The newly re-surfaced Box Hill track was like a carpet, making my steady progress easier. No Strava beating time today. It was clearly lunchtime and I hardly saw another cyclist on the climb, which is very unusual for the ‘Alpe d’Huez of South England’. I started imaging the Olympic road race making their 9 circuits on route to a Cav gold medal. I promised myself a cup of tea at the top, but one look at the queue and I decided I would rather reach home half an hour earlier. I had left home at 7am. I wanted to be back to watch the second half of the footy and see if my team,QPR, could stay up in the Premiership. So, another gel downed on the move and I chugged on. I know the route home from here well and have pushed back at pace to Kingston in the past, so despite the light headedness I targeted a low tempo pace and move things a little quicker. My legs were having non of it. The best I could manage was aerobic endurance pace. The wattage was low, but I had given up on the numbers. I just wanted to be home in one piece and avoid bonking or cramping. This is the time when I wanted a Star Trek Transporter with Scotty to ‘beam me up’. I was fantasising so tried to come up with a mantra. ‘I can do it. I will do it’. Pathetic I know. Then, embarrassingly John Denver, ‘Take me Home, Country Roads’. No! get out of my head. That is soooo uncool. I listen to XFM not John Denver. Your mind plays odd tricks on you when you are tired. The Sunday morning riders were gone and the roads were light on traffic too. I trudged past the BP garage at Epsom where I bonked last year on another ride and downed Lucozade and Snickers. Through the Horton roundabouts. No Kingston Wheelers sprint today. Onto Chessington and then Kingston and Richmond Park. One more climb in Richmond Park. Step down onto my 29 cog and whirl away. I felt my left leg starting to cramp. 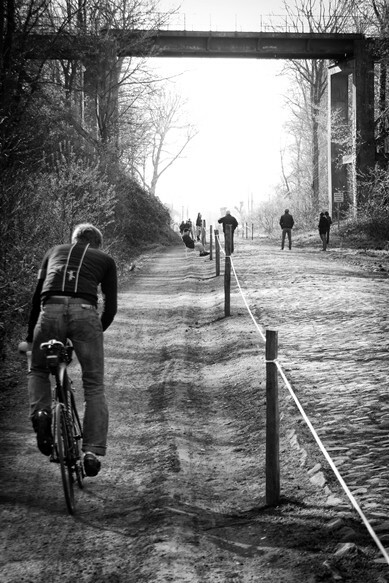 It always happens on this climb on my way home. No, I will not allow it to cramp. I’m imaging it, I said to myself. ‘I can will it not to cramp’. Thankfully, the climb is short and sharp. I was soon through it and then able to coast on the flat. A look at the ‘fresh’ riders as the overtake me at pace. ‘Do they know I have already completed 160km?’. I stumbled in through the front door to be greeted by my son. ‘It’s half-time, QPR are losing, Bolton are winning, we are going to be relegated. Lets play ping pong to take your mind off it!’. We’re running a fun new competition for our La Fuga Strava Club members online to get our fugisti sharing stories about their riding. For one week each month we will review our Strava Club member’s rides and choose a short-list of the most impressive rides during the 7 previous days based on comments, kudos and our own general impression of how tough the ride was. We will then invite these members to write a short story about what they remember from that particular ride, epic stories are encouraged, photos score extra points. We will post these stories for all to see, with the Strava stats from the day and based on the general opinion and our own thoughts, we will award the prize to the most epic ride of the week. La Fuga decision is final! Not a member of our Strava club yet? It’s easy and simple to join and will connect you with many of our current, previous and future guests. ‘What is the prize?’ I hear you ask. Well for the forthcoming week we’ll be giving away a stylish La Fuga casquette to wear on your upcoming epic rides. Special prizes may be considered for particular efforts of epic-ness and prizes will evolve as the week’s progress. Not on Strava yet and want your ride to be considered? Well if you can send us enough proof that your ride was particularly epic along with a great story, we’ll automatically put your ride into the shortlist! Want to start sharing your rides with friends and competitors? Garmins new Edge 200 GPS cycle computer offers the easiest most affordable way of entering this new exciting world of online ride tracking and sharing. 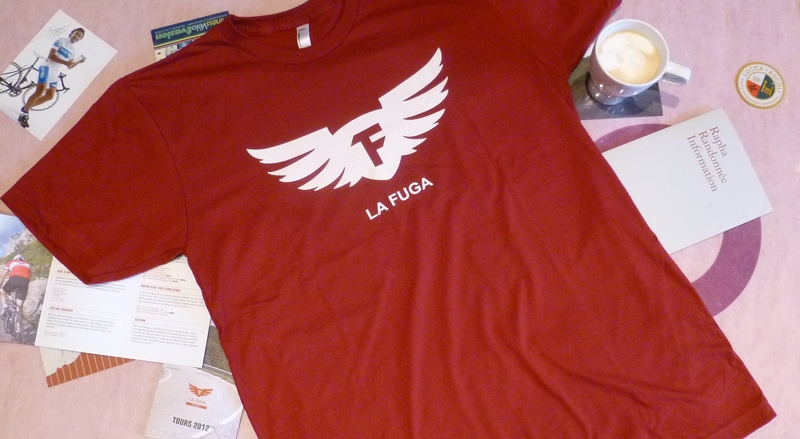 La Fuga are offering our popular T-shirts for sale for the 2012 season. The T-shirts are made by American Apparel and their premium weight, maximum comfort and longevity makes them the perfect garment for post-ride relaxation. 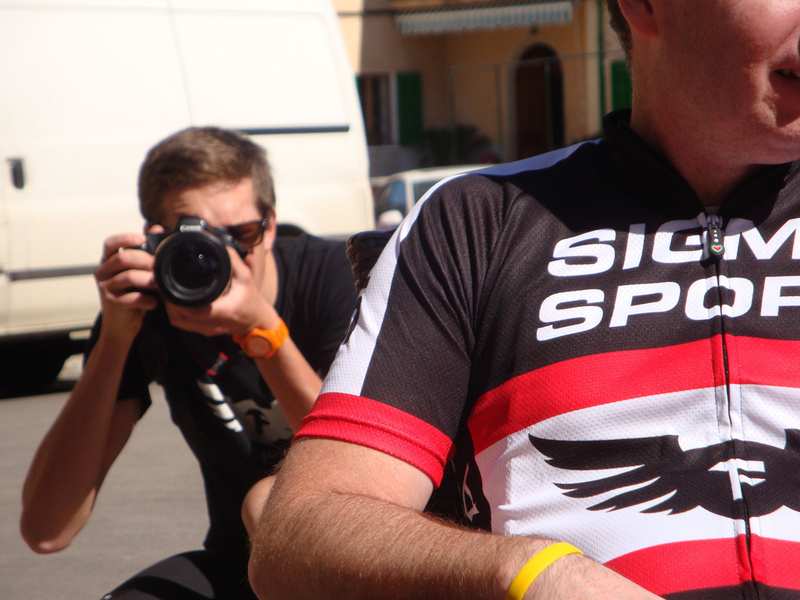 The Fine Jersey T is made from 100% cotton and coupled with our iconic logo and brand new ‘Ammiraglia’ design for 2012, you can guarantee a piece of clothing worth adding to your cycling collection. Prices include UK delivery, for overseas delivery please contact info@lafuga.cc/beta for more information. The ‘Ammiraglia’ (or the flag bearing team car in Italian) design pays homage to the VW campervan surfer T-shirts with a cycling spin. 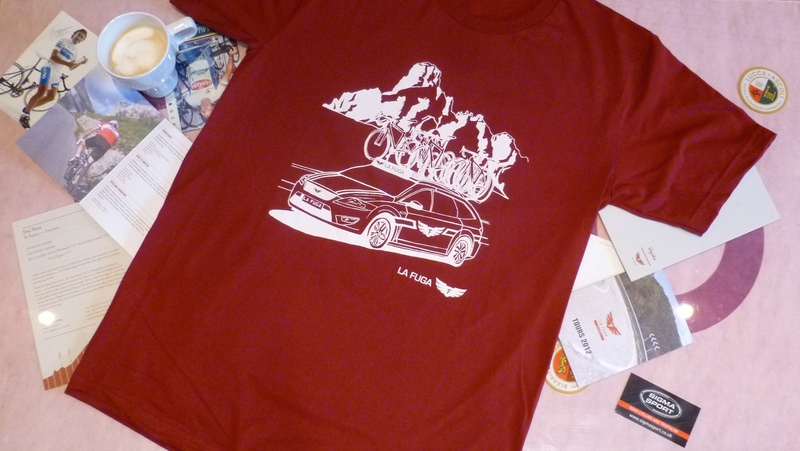 With the silhouette of the Dolomites in the background and the La Fuga team car on the road, we think this new design will prove popular in 2012. 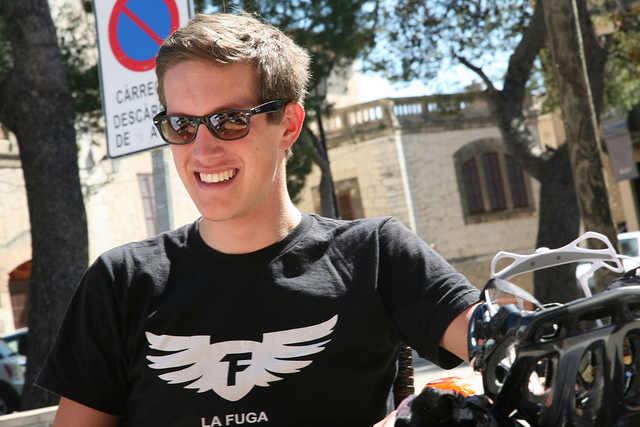 The classico La Fuga logo t-shirt as worn by our intrepid guides througout Europe is now available to buy. Featuring the distinctive wings of steel motif emblazoned across the chest on a natural coloured premium weight, 100% cotton t-shirt, the classic t-shirt is perfect for post-bike relaxation of comfortable, stylish travel. They are designed for a relaxed, comfortable fit. 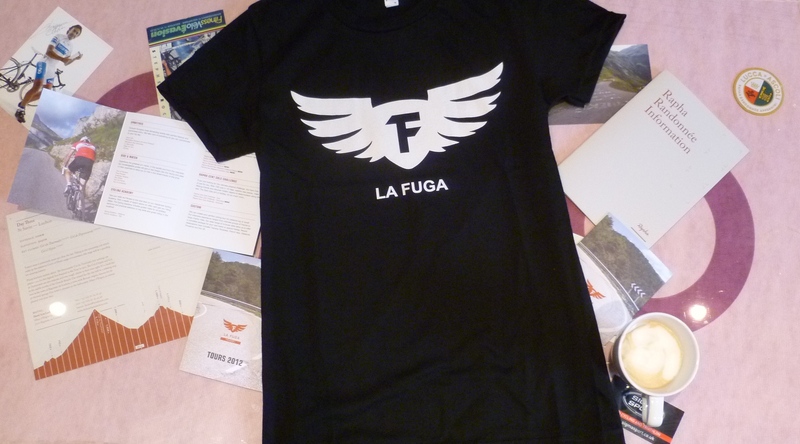 The t-shirts are available to buy whilst on your La Fuga tour and via our online order from. Payment will be made via our secure payment page. Postage and packaging within the UK will be at a cost of £2. 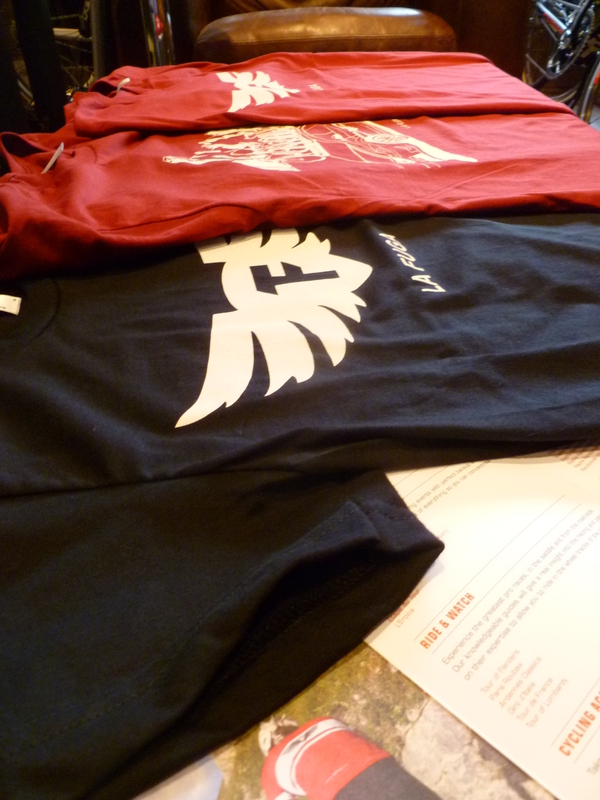 Please contact info@lafuga.cc/beta for postage costs outside of the UK.